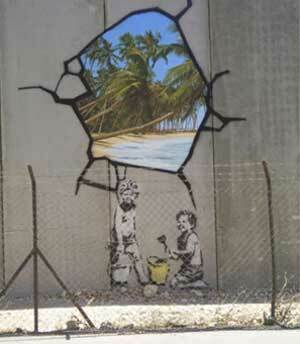 For his latest act, vaguely subversive stencil artist Banksy has visited the West Bank and painted the controversial Israeli "security wall"; pictures are here. The activity doesn't seem to have made him many friends; Israeli troops didn't see the humour in it and pointed their guns at him, while an old Palestinian man complained that it made the hated wall look beautiful. Sounds nicely Orwellian, wouldn't you say. Or perhaps like Margaret Atwood's "freedom from" vs. freedom to". Scientists have found that the River Po in northern Italy is full of cocaine residue; or, more precisely, of benzoylecgonine, a chemical produced only by metabolising cocaine and eliminated in urine. According to this test, people around the Po valley consume one and a half metric tonnes of cocaine a year, three times as much as official estimates suggested. In other related news: cocaine traces found at EU parliament. This brings up a delicate point about justifying manned missions with science. In order to make any straight-faced claims about being cost effective, you have to cart an awful lot of science with you into orbit, which in turns means you need to make the experiments as easy to operate as possible. But if the experiments are all automated, you remove the rationale for sending a manned mission in the first place. Apart from question-begging experiments on the physiology of space flight, there is little you can do to resolve this dilemma. In essence, each 'pure science' Shuttle science mission consists of several dozen automated experiments alongside an enormous, irrelevant, repeated experiment in keeping a group of primates alive and healthy outside the atmosphere. The ISS was another child of the Cold War: originally intended to show the Russians up and provide a permanent American presence in space, then hastily amended as a way to keep the Russian space scientists busy while their economy was falling to pieces. Like the Shuttle, it has been redesigned and reduced in scope so many times that it bears no resemblance to its original conception. Launched in an oblique, low orbit that guarantees its permanent uselessness, it serves as yin to the shuttle's yang, justifying an endless stream of future Shuttle missions through the simple stratagem of being too expensive to abandon. But NASA dismisses such helpful suggetions as unworthy of its mission of 'exploration', likening critics of manned space flight to those Europeans in the 1500's who would have cancelled the great voyages of discovery rather than face the loss of one more ship. Of course, the great explorers of the 1500's did not sail endlessly back and forth a hundred miles off the coast of Portugal, nor did they construct a massive artificial island they could repair to if their boat sprang a leak. The Soviet Shuttle, the Buran (snowstorm) was an aerodynamic clone of the American orbiter, but incorporated many original features that had been considered and rejected for the American program, such as all-liquid rocket boosters, jet engines, ejection seats and an unmanned flight capability. You know you're in trouble when the Russians are adding safety features to your design. The NASA obsession with elementary and middle school participation in space flight is curious, and demonstrates how low a status actual in-flight science has compared with orbital public relations. You are not likely to hear of CERN physicists colliding tin atoms sent to them by a primary school in Toulouse, or the Hubble space being turned around to point at waving middle schoolers on a playground in Texas, yet even the minimal two-man ISS crew - one short of the stated minimum needed to run the station - regularly takes time to talk to schoolchildren. Of course, in the Bush Era, even more billions will be spent on sending primates to wave the flag in space and keep defense contractors in clover boldly going where not many men have gone before.